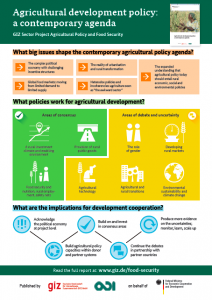 The Challenge: For policymakers, supporting agricultural development can be daunting task– both in terms of what agriculture is expected to achieve for development and also the conditions under which it takes place. Our Approach: The German Agency for International Cooperation (GIZ) tasked our team to help shape the content of a comprehensive guide for policymakers that they had written in partnership with the Overseas Development Institute. The report aimed to capture the policy areas where consensus exists as well as where debates and uncertainties still remain lies in which interventions work. Outcomes: We worked with the report authors to craft new messages for the report; restructured and edited it; and then translated and designed it (view the full report here). 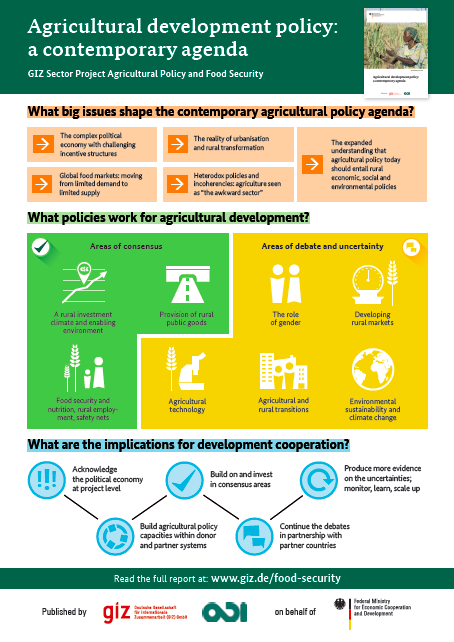 We also produced an infographic (English and French versions) to help with the report’s later outreach both online and in workshops throughout Africa.